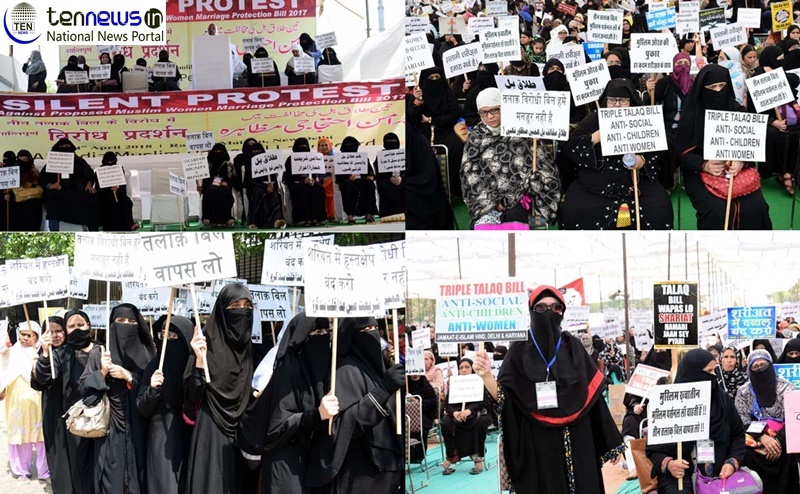 New Delhi: The Ram Lila Maidan witnessed a massive women rally today as the women of Muslim community clad in black hijab gathered at maidan to raise their voice against triple Talaq Bill 2017 passed by Lok Sabha recently. Citing Triple Talaq Bill is an attack on the Sharia laws, anti-Muslim women, anti-children and intentionally move to affect Muslim women thousands of Muslim women hold a massive rally at Ram Lila Maidan in Delhi today and registered their strong disappointment against union government’s Triple Talaq Bill 2017. Since the Union Government has tabled the Triple Talaq Bill in the Parliament, pro-Muslim organisations and women holding rallies and protest across the country against the bill. In this row, on April 2, 2018, Muslim women hold a massive rally at Mumbai’s Azad Maidan. Women from Delhi and nearby districts gathered at Ram Lila maidan holding posters and pamphlets against the bill. They have been demanding, Union Government to immediately withdraw the bill because neither this bill will eradicate the social evil instant Triple Talaq nor they don’t want any interruption in Sharia Laws.